After descending a distance of 99 km from Gangotri and travelling for most of the day, we concluded Day 2 by paying a visit to the temples of the religious town of Uttarkashi. Situated on the banks of River Bhagirathi is Uttarkashi, an important pilgrim centre which is often equated with Kashi (Varanasi). It is situated at an elevation of 1150 meters. During Magh Mela, people visit Uttarkashi to take a holy dip in Bhagirathi along with their village deity. Dedicated to Lord Shiva, Kashi Vishwanath Temple is an ancient and the most famous temple in Uttarkashi. It is said to have initially been built by Sage Parshuram and which was later renovated by Maharani Khaneti, wife of Sudarshan Shah in 1857. The Shivling is 60 cms in height and 90 cms in circumference. This is the most important shrine of Uttarkashi and should not be missed if you are traveling to this part of the country. Guess the time at which these pictures were taken? It was just around 5.00 pm! Still it looks like its very late into the night, isnt it? The sun sets early in these areas, especially in the winters, and it gets dark pretty quick. By 9 pm, everything is wrapped up and people are back in their homes! Just opposite to the Vishwanath temple is the Shakti Temple. 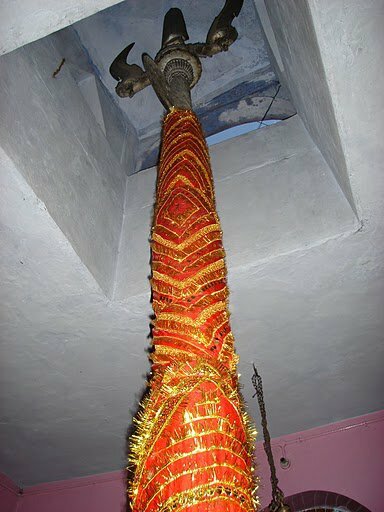 The main attraction here is a huge and heavy trishul (trident) - 6 meters in height and 90 cms at the bottom which was thrown at the devils by Goddess Durga. The trishul, as the priest told us, is made of iron in the upper part and copper in the lower part and is revered as a form of Shakti. One amazing feature of the trishul is that it cannot be moved with your entire body force but it vibrates the moment you apply pressure with one of your fingers! That was indeed some kind of magic! We also visited two other local temples - the Kandar Devta Temple and the Temple dedicated to Parshuram – an incarnation of Lord Vishnu. Other Temples we could not visit are Kuteti Devi Temple, Ekadash Rudra Temple and the Gyaneshwar Temple which are also said to be worth a visit. Other than the temples, there is a Nehru Mountaineering Institute or NIM which is a famous mountaineering training Institute in India. Trekkers and mountaineers can hire the different mountaineering gadgets and accessories from NIM for their adventure. What a great place - so many wonderful temples to enjoy. Beautiful temples one certainly won't see in most travel books! The 4th picture seems to hint of buddhistic influence. like you, i love spiritual destinations. i envy you for this pilgrimage, arti. Wonderful post. The pics look great as well for the dim light you had to shoot them at. Marvelous tour of such lovely temples, Arti! And your photos are terrific as always! Hope your week is going well! This is a very informative post. The pictures look great. It is interesting how these temples are ornate in their decoration but not ornate in their architecture! The more I read and see about India, the more I am intrigued by it! As always very interesting. I'm intrigued to know more about the inscription on the black stone outside the Vishwanath Temple. Such beautiful temples and sights Arti, the Shakti one seems especially pretty to me! It's amazing, how much there is to see in India. Hope you have a wonderful day! Seems like you have covered most of the famous temples of North India. Beautiful pictures! I enjoy seeing the color and design during your travels. So different than my life. The trident sounds so interesting especially since it will vibrate with a touch, but yet is immovable. Hi... I have an award waiting for you at my blog.. plz come pick it up thank u xo. The story of that trident is so unusual and interesting!! Thanks a lot for your wishes and concern, made me really happy... How are you doing? I have missed a lot of your posts, will try and go through them. Such beautiful and colorful temples in your county - lovely to be able to see them through your photos and words. Thanks, Yes it had really gone dark though the time was only about 5 pm!! Its really amazing these things, the trident oscillates freely if touched with the finger but it wont budge if you apply your whole force with your hand!! Arti, this is wonderful! I have been catching up with your posts, so havent left comments everywhere... but wanted to tell you that following your journey has been wonderful! Its been a very long time since i did this circuit, and then it was a hurried trip, so thanks to you i can now plan a detailed trip whenever i decide to go again! Loved the journey and the pictures. Evening pic taken at Shiva temple is awesome. All these temples are a mighty testimony of an ancient culture and beauty. My hope is that the people of India rooted in so many cultures and spread all over the world for centuries, must be allowed to live in peace with oneanother. Without love and peace religion is but a beautiful, but empty shell. Arti --Like the commenter above, I wondered too how you manage to get so many beautiful pictures without crowds of people. What lovely pictures. Makes the post even better! Very beautiful and colorful temples! The trident is very interesting!!!6meters....! Great post. Superb pics too. 6 meters in height is high. The architecture reflects human hearts. 6 m high trident.... amazing!!! @Magiceye @Sallie (FullTime-Life) The absence of crowds is due to the off season. The main temple of Gangotri (Uttarkashi is a major town enroute to this revered shrine high up in the mountains)was just about to close and hence the pilgrim traffic was very very thin! @Sallie (FullTime-Life) I was there in November. So then the days are short! Plus, it being a mountainous area, the sun tends to hide behind the mountain and the cloud cover contributing to the reason for the early darkness. Airtel got the free advt on your blog. How long was this trip? Looks like you covered several places in one go! Must have been a truly uplifting experience.Your blog always reminds me how many things are there to be seen still! Hi Arti! I am reading this post in the morning, so it such a divine coincidence, in the morning I got Bhole Baba's Darshan! The Trishul is unbelievable. and I pray I may visit there to experience that magic. Thanks for sharing! Thanks a lot for accepting my suggestion too, it is very easy now, without word verification. But I am worried, you will have to deal with spam comments. I am searching some spam block plugin, if I get it, I will surely tell you! @Richa The trip was only 6 days long! @Mohinee Yes, thanks a lot for the suggestion :) And thanks to the automatic spam detection system of blogger, Spam comments are not troubling me much! Great to know about these places. Never been here before. How fortunate you are to live in India, to be able to visit the sacred temples and walk the hallowed paths vibrating with holy energy from the lotus feet of God's beloved saints and sages. I pray one day I will touch my forehead to Indian soil. I love my Ohio, but my heart longs to bathe in the Holy Ganges. Jai Ram! Excellent post, was intrigued by the Trishul in the Shakti temple. Thanks for sharing.